Several years of volatility in the IPO market as a result of the financial crisis have created the largest backlog of IPOs since 2000. With so much in the pipeline, investors will have a plethora of investment and growth opportunities to choose from. While this is good news for the investment community, it makes it difficult for businesses attempting to go public to stand out in a sea of IPOs. The challenge becomes one of differentiation and while strong financials are key, in a crowded marketplace, real differentiation is what gets you noticed. Brand can play a significant role as a differentiator. IPO candidates often have a shorter window of time to develop and strengthen their brand to be more than competitive… to be enticing. This requires having a ‘rapid deployment’ brand process that can achieve maximum effectiveness in a short period of time. This has become the era of Turbo-Branding, a condensed way to create a powerful brand to take advantage of the cash heavy private equity market looking for good returns. Another outcome of the economic crisis is an abundance of distressed companies with low valuations, making them ripe for acquisition. For distressed companies, a weak brand is often part of the problem and so, once acquired, the brand needs immediate attention. Here too, Turbo-Branding can rehabilitate and reboot a struggling brand in less time. 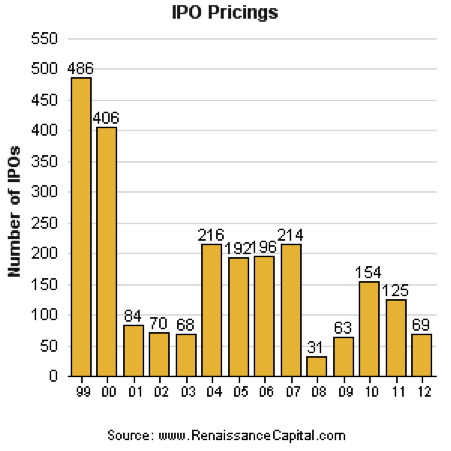 To give some perspective, in 2007, the number of completed IPOs (IPO Pricings) in the US peaked at 214. In 2008, the IPO market was essentially at a standstill with only 31 IPOs. 2009 was only marginally better with 63 IPOs as investors shifted assets away from riskier investments into safer holdings like U.S. treasuries. 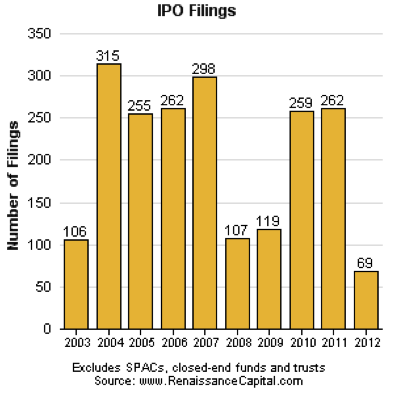 IPOs increased again in 2010 and 2011 but not to the same levels as before. Similarly, the number of filings also plummeted in 2008 and 2009 with only 107 and 119 respectively, less than half the number in the previous four years. This dearth of IPOs ended in 2010 when 259 companies filed for IPO and another 261 in 2011. Despite the increase in completed IPOs in 2010 and 2011, almost half of the companies that filed in those years are still waiting to go public, resulting in an abundant pipeline of IPOs, waiting for the market sentiment to change. Now, as the economy is turning, there is an enormous momentum from investors wanting to extract value and raise capital to be able to grow their businesses. And the winners will be those that have strong fundamentals, a solid management team, and a compelling brand. While not an avalanche like the tech bubble of the late 1990’s, the pent up desire for public capital is still staggering. And because there is so much in the pipeline (over 200 filings), there will be great pressure on analysts, investors, exchanges, and the media to identify the best investments. Unlike the normal deal flow that the IPO community has been used to, it will become harder for a company to stand out from the herd. This is where the power of a strong brand can garner greater attention than other business ideas that are not as clear and differentiated. It will be incumbent on companies thinking about an IPO to plan ahead and build the strongest brand foundation possible so that when they seek capital, they will be met with greater enthusiasm than others. Another factor facing business looking for public capital will be the inherent skepticism investors have about “opportunities”. Building brands in today’s environment is a different animal. We all have become quite distrustful about brands for good reason. So developing a strong brand that can resonate with key audiences has a new set of challenges. Brands today must be shaped to engage investors, customers, the media and employees to all feel positive. Further, investors are skeptical about whether new public capital will be used to pay off early stage investors or actually invested in growing the business so the brand has to support the business case. Lastly, a company seeking to do an IPO is already in business and has demonstrated momentum. Therefore, branding should be focused to support and grow the current customer base, and not alienate the franchise in any way. So while customers are not the direct target of the money, they are the reason why people will invest. A brand needs to speak to customers in a powerful and confident manner so they stay engaged and even expand their economic relationship with the company. And importantly, a new brand also needs to attract to new customers. So while public funding is the goal, the longer-term value of the brand is to grow the business. Most marketers understand that it takes years and significant resources to shape and own significant brand equity. However, for an emerging business looking to have a successful IPO, there is rarely this luxury. As a result, the process of Turbo-Branding has been developed to efficiently short-cut traditional steps in the branding process, and get to the heart of the key branding issues more quickly. This, in turn, can help a management team develop a strong brand for presentation to investors, the media, the exchanges, and even employees who will need to become strong brand advocates leading up to (and following) the IPO. The basis of Turbo-Branding is to embrace the need for speed and accuracy. What it does is condense branding steps and adopt new ways to assemble the insights necessary to more rapidly shape a brand. In a sense, the need for expediency has enabled us to look at ways to concentrate thinking and output on the brand side of the business. • Small management team or Board committee must be willing to meet quickly and with whatever frequency necessary because there is literally no time for broad operating management or employee “buy-in”. Having a nominated core team to rapidly make all the decisions is imperative. The CEO must head this up to be sure the brand reflects what the public company will be. In parallel, development of a communications strategy to cascade key information to the broader leadership team to keep them fully apprised about brand development. • Accelerated process of gathering necessary inputs. Traditional processes have to be made more efficient, and the core team has to shortcut learning. This means knowing what information is critical to make informed brand decisions and guide analysis. Said another way, we have stripped out what isn’t absolutely critical to shape a new brand. • Step-Up brand development. While the brand development process needs time to percolate, we have created a much more accelerated brand design program to deliver options and also seek quick response by the core client team. One key was to develop a very tight brand strategy to guide brand development. • Parallel brand launch planning. With time frames so condensed, developing a launch strategy and launch planning in parallel ensures the actual IPO launch will be successful. We form a launch team to focus specifically on the listing day and the activities surrounding it. Another key is to use the event as a customer relationship opportunity, and not leave them guessing about the rationale for the IPO. • Rapid brand deployment. Systems and procedures need to be developed to centralize and control brand training and the dissemination of branded materials, particularly with a company that has global operations. Without the luxury of time, it is critical to organize a brand communications structure and digital materials access to ensure a broad-based and coordinated implementation. While we had been practicing Turbo-Branding for several years, it became more formalized when a large, global financial services client decided to spin-off a major portion of its business in under a year. This meant rapidly shaping a new brand and using it to gain the attention of the banks and investors. No mean feat. The company was a venerable institution, over 200 years old, and had become a major global player in the financial markets. It had grown significantly but the business had become quite complex, and now wanted to separate off a very specialized division and concentrate on its core business. Management and its financial advisors had determined that there was an eight-month window where they believed the listing could generate maximum value. So rather than employ a more traditional brand process that easily takes 12-18 months, we employed Turbo-Branding to accomplish their objectives. • prepare all the materials necessary for the IPO. This was a significant under-taking for a very short time frame. (Along the way, often the smallest tactics have interesting value. We were able to secure a rare coin from the company’s founding year to present to the president of the New York Stock Exchange as a token of thanks. This did wonders in terms of cooperation). Our Turbo-Branding process focused on intelligent ways to accomplish key steps. Concentrating on developing a Vision, Mission and Values for the new company by having all leaders in one room to discuss and debate what the public company would stand for. We employed several visioning tactics to facilitate these discussions. Because public companies have to answer to many more audiences than private ones, especially public shareholders and regulators, the media scrutiny is much more intense. Thus, clarity of the Vision, Mission and Values became a cornerstone for leading the new company, as well as focused brand development. Securing a new name globally. In the case of a spin-off, this meant having corporate counsel and external IP attorney’s as part of our working team. There are always enormous issues that arise that a strong working team can identify and resolve, often overnight. Because naming decisions today always contain some level of risk, this working partnership enabled quick decision-making. Creatively designing the new identity. Design development always needs to be strategically driven to have true focus. By spending significant energy on the guiding strategy, this helped the brand developers work most efficiently, as well as the leadership in evaluating brand alternatives. Developing a launch plan early on in the process. Short-term brand development windows also make it very hard to execute flawlessly. We developed a practical launch plan and process at the early stages of brand development to make the actual launch most effective. Because an IPO is a significant media opportunity with the financial, trade and consumer press all putting a company under the microscope, having the launch go off without a problem is crucial. Developing systems to deploy the brand globally. Beyond having designed a new brand, it has to be rapidly deployed around the world. It was key to put in place easy-to-manage systems prior to the launch so that a) brand training can be cascaded throughout the organization, b) brand materials would be easy to access and reproduce so that there is a consistent brand presentation in every market, and c) there would be a brand help desk to answer the myriad of questions that arise with a new brand program. Given the objective to leverage a new brand to maximize business, it was important to have these systems in place. By employing the key steps of Turbo-Branding, we were able to help our client successfully launch a new global brand on the NYSE within eight months. With the IPO market and M&A activity really heating up, Turbo-Branding is an effective process for developing an effective and strong brand foundation that can separate one company from others and gain the attention needed to successfully go public or to attract the right investors.